An immensely satisfying mix of platforming, stealth, action, and resource management, with character. I hate player statistics in games. I don’t want to know how many times I’ve tried and failed to complete this game (dozens), or how many thieves have died for my efforts (hundreds). So it’s a real compliment to The Swindle that I continue to go back again and again despite the evidence of my ineptitude. The first few deaths at least I could blame on inexperience. As with Spelunky, from which the developer has admitted to taking a lot of inspiration, tutorials are minimal. You have 100 days to steal enough money to then steal a device called the Basilisk that will make thievery an unviable career. Each day you attempt to rob a procedurally generated building whose rooms fit to an invisible grid, piles of cash stark against the sketched of furniture in the background. You can move, jump, hit things with a stick, and “interact”, at first just to open doors and later to do things like hack computers for more money. My first thief died by falling too far. Through the sacrifice of several of his colleagues, I learned that mines destroy a 3x3 square around them, that the robots that guard these buildings can see through windows, and that if you’re spotted then computers start to lose money and hordes of police robots are summoned. Once I knew the basics, I could only blame my continued failure on my greed and impatience. There are various types of guard bot, with varying abilities. Their eyelines are represented by unambiguous yellow rectangles; the ones with guns will shoot you; the ones with spikes present a hazard even in death. Through observation and experience, you learn more: how fast they move, how many hits they can take. You start to feel really clever, even though you know that’s because the bots are really stupid. Once I knew the basics, I could only blame my continued failure on my greed and impatience. The computers hold the big money, but it’s always tempting to go after every pile of cash. The risk/reward balance is perfect: manage to get everything and you get a 100% score on your heist report, but one wrong move could lose you everything. Death is sudden and dramatic, thanks to the cloud of bank notes that explode from your thief’s corpse. But aside from the cash gathered in that heist and the thief’s experience, which grants a bonus at the end of heists, you don’t really lose anything—upgrades are transferred to your next thief. Sometimes I’d get one with a particularly cool procedurally generated name and appearance—maybe Maxine Thugger, with multi-coloured hair and an eye patch—and I’d say to myself, “I like this one; this one I’ll take extra care of,” but then I’d have her hack a mine too hastily and blow herself up, or let greed keep her around for too long after the alarms had sounded. Even when I couldn’t scrape together the cash to unlock the higher security levels and leave the slums behind for the cash-rich but well-guarded suburban homes, warehouses and casinos, I kept going back for more because the basic platforming was satisfying enough on its own. 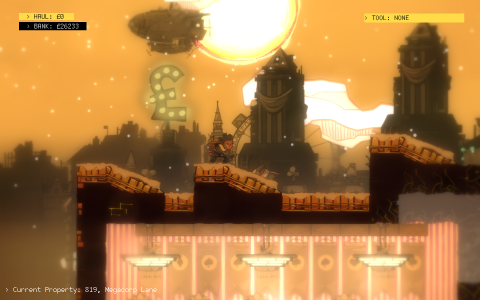 It's fun to navigate each procedurally generated property, by sliding down walls, whacking bots and seeing the cogs fly, scaling rooftops to see the rain fall on the steampunk London backdrop. The only complaint I can muster is that sometimes I seemed able to jump higher than my current reach and sometimes I couldn’t, but that becomes less of a problem once you upgrade your jump. As I got better, the game really opened up. I started to splurge on upgrades. At first, your choices are motivated by the levels themselves: unreachable heights encourage you to upgrade your jump, locked doors require improved hacking, and bombs let you solve all kinds of problems. But as my bank account swelled I began to focus on upgrades that would suit my particular play style, like one that rewards you for every bot you kill with cash that goes straight to your bank account. That's useful because you get to keep the cash if that thief dies. Even as you unlock more upgrades and heists get more complicated, The Swindle is as streamlined and readable as it is in the very beginning. You can still understand everything you see on screen, and all behaviour in the game is predictable. The interaction between The Swindle's relatively simple systems can create satisfying action movie moments; one moment you're hiding and waiting, the next you're leaping about and timing attacks so that your target falls before anything can spot you. Not since Spelunky have I found a game so compelling that I’ve continued to play after so many deaths, and honestly, I think The Swindle has set a new record for me there.